History of firefighting: Cartoon of Boston firefighters in 1837. 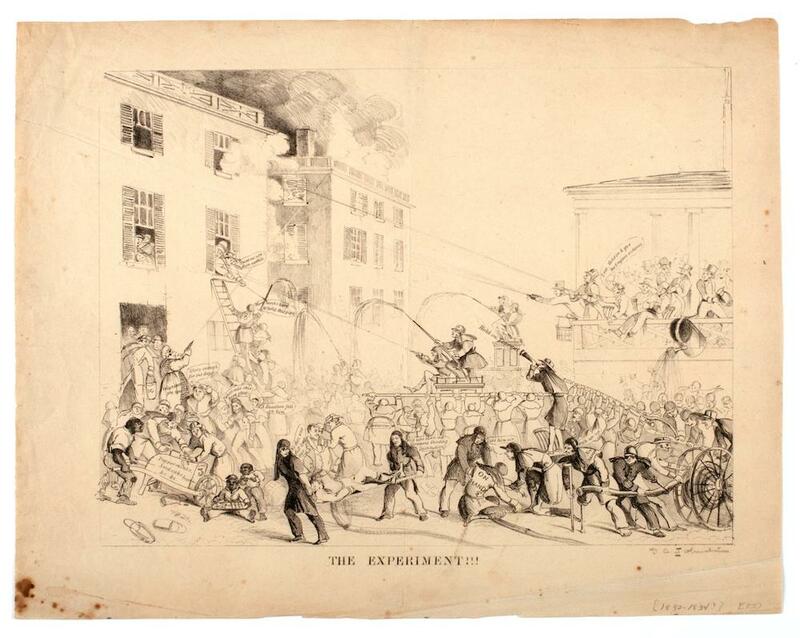 In 19th-century humorist David Claypoole Johnston’s cartoon “The Experiment,” a Boston crowd watches a building burn, as inept firefighters struggle to get water onto the blaze. Matthew Pearl’s story in the Atavist, “Company Eight,” describes the “experiment” the cartoon critiques: Boston’s 1837 move to professionalize firefighting, standardizing an endeavor that had been inefficient at best, and deadly at worst. As Johnston’s art shows, not everyone believed that this innovation would work. Early–19th-century firefighting in the cities of the American Northeast was chaotic and ineffective, with companies—fraternal organizations operating on a volunteer basis—competing against each other to score access to fires. Conflagrations often got out of control as firefighters, enjoying the party atmosphere, got too drunk to respond effectively. Companies elaborately decorated their firehouses and marched in parades, but didn’t devote time to drill. Johnston’s cartoon, which Pearl dates to the year that the city decided to switch tactics, depicts a raucous scene of the same kind that took place under the old regime. Firefighters faint, onlookers heckle the engines’ efforts, and residents of the burning building despair. David Claypoole Johnston, ca. 1837.